We are presenting 2 Pcs Glass Set for our valuable clients’. These products are manufactured by our professionals with the help of using optimum grade raw material. Our offered products are well known for their attractive design and durability. Our offered products are available to our customers’ at cost effective price range. Giftee Solution is established in 2015 in Moradabad as the prominent manufacturer and trader of a wide range of Product. 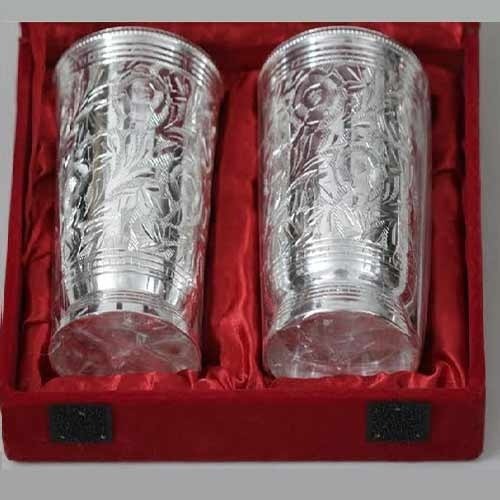 Giftee Solution is the reputed in the domestic market for Manufacturing, and supplying handicraft made of brass, copper, iron, aluminum, wood and glass. At GIFTEE SOLUTION, we design and fabricate art wares having aesthetic sense mixed with beauty and useful effects.the need, requirement and satisfaction of our client are our top priority. We specialize in garden ornaments, fire-place accessories, copper utensils, candle holders, EPNS, wooden items, lamps, glassware's, nautical, mirror and photo frames.our product create magic every where by enhancing the beauty of any location –whether it is the garden, kitchen, bedroom, drawing room or the terrace. The varied product have been sold nationally for over the past so many years now. There are thousands gracing the houses in many countries. The unique designs and patterns have endeared them to collectors from coast to coast and border to border. We know you will enjoy them yourself, and your friends will appreciate them as gifts. Compare our quality, fine craftsmanship and detailed carving with any other product in the same category and you will see that our products are much better. Giftee Solution maintains its uncompromising commitment to quality by continuing to utilize the age – old tradition of Indian crafts. In addition, we offer many more product related to Brass,Iron and EPNS ware. These products are made using high quality raw material and ensure perfect finishing and elegant design.